Exhibition featuring Challis herd will open in Hailey [Idaho]. Idaho Mountain Express. There is a wild horse herd in Idaho. It’s near Challis. You can often see them in the East Fork of the Salmon on the Greenfire Preserve and the BLM land to the east. I have a feeling that wild horses are becoming more popular. I long regarded them as feral stock, but they are beautiful and very capable of taking care of themselves. Last winter a wolf tested them on the Greenfire. He barely escaped the wrath of the lead stallion. The only thing that frightens them are the BLM’s helicopters. There are also wild horse herds in Montana, Wyoming, and Nevada. Maybe more in other states. Folks who know please post. This is not something I know a lot about. Wild horses from the Challis herd on the Greenfire Preserve. East Fork of the Salmon River. June 2006. Wild (feral) horses are reasonably common in southeast Oregon. The BLM does an annual roundup/sale of animals from near the Steens area. Back in April, I came across a stallion and 3 mares in the Diablo Mountains, east of Summer Lake. On wilderness surveys with Oregon Natural Desert Association, we’ve seen some in the North Fork John Day River area, too. My understanding of wild horses is that although beautiful, they devastate desert landscapes as they are not native. There is not enough forage to support the population of wild horses in the desert and they drive out native species due to lack of food. It is a major problem in certain areas of the west. We have a fairly large population in the western deserts of Utah. It can be very exciting to watch them. However they can have a large impact on our desert ecosystem, especially desert springs where they can congregate and degrade both water quality and bank stability. The herd that hangs out along the Pony Express Route near Simpson Springs, Utah. Is quite tame and will rarely run from approaching vehicles. It is a remarkable contrast to the herds located further to the south and west that will run at the site or sound of a vehicle. The Utah BLM office holds auctions/adoptions on what seems like an annual basis in an effort to control their numbers. I have often jokingly said that they are the most protected animals in the country as they are managed and protected under their own Wild Horse and Burro Act. I happen to have done a lot of research for a long time on horses. I raise them, etc. To say they aren’t native is off base, they haven’t necessarily been here since the beginning of time but they have been for hundreds of years. There aren’t enough wild herds left, at least in Idaho, to cause significant damage to a significant area foraging. This is another fading part of the west that does need some attention. Colorado has mustangs in pockets on the western slope. There are herds around Grand Jct in the desert as well as in the northwest part of the state around Rangley. There are also a couple of herds in the southwest corner near Towaoc on the Ute Mountain Ute Reservation (up the Mancos Canyon) as well as near Dove Creek, along the Dolores River. I have also seen wild horses on nearly every trip down the Green River through Desolation Canyon in East Central Utah. They are on the east bank about 30 miles downstream of the put-in at Sand Wash.
For a rather disturbing understanding (or side of a story if you may) of the BLM’s management of the remaining wild horses, I strongly suggest reading the November 2006 issue of Vanity Fair – Wild Mustang Slaughter. The article discusses how despite the Wild Horse Protection Act, many/some of the “adopted” horses wind up in slaughterhouses. The article also discusses the rift created by those who claim that the wild horses damage the grazing areas of domestic livestock. Also discussed is to whom the BLM leases its land to along with the cost for same — nearly pennies on the dollar compared to private land. Wyoming has a fairly active wild horse adoption program. The state prison in Riverton has inmates that train the wild horses to be adopted. Its not the best situation, but the inmates are never allowed to abuse the horses and they rarely put a horse down. Some of the horses do end up in the slaughterhouses. The BLM is trying to weed out the “kill” buyers, but some slip through. The root of the problem is that the BLM is mandated to round up a portion of the horses on federal land to protect the grazing rights of a few ranchers. Wyoming has even gone as far as reducing their hallowed elk herds on the allotments to give cows more forage. And although the horses should be protected under the Wild Horse and Burro Act, they are made to yield to the will of the few over the rights of the many. If want to look at the impacts of non-native species on the desert, you have no farther to look than cows. Its the cows on the desert that do the damage, not the horses. I’ve seen many wild horses in northwestern Nevada. The range on the Sheldon National Wildlife Refuge looks like a horse stye with manure all over the place. It seems rather grotesque to me that non-native feral livestock like horses are protected and are allowed to damage our public lands because of public affinity for them that overlooks or purposely doesn’t take into account ecological health. Horses are pretty but what they do to land sometimes isn’t. According to the USDA, horse meat is higher in protein and lower in fat than beef and has a sweet taste with a flavor between beef and venison. That sounds pretty tasty to me. Sage might a make a difference though. Still, I don’t hunt and probably wouldn’t have the guts to shoot a horse. I’m not sure horse hunting would take off in the U.S. But, it probably wouldn’t cost as much as the perpetual BLM round-up operations and might actually make wildlife agencies some money that could be used for ecological research. It also may improve the range but that depends on whether other livestock replaces the horses. I agree that cattle aren’t great for the range, but I doubt adding feral horses to the mix makes things much better. I was a BLM wildlife biologist for nearly 20 years in the Challis area and am very familiar with that area. The wild horse program a huge financial cost for BLM, money that might be put to better uses. I won’t try to defend cattle grazing on the public lands, but those wild horses are out there yearlong, continuously grazing the same areas week after week, month after month. Riparian areas in particular, around springs and along streams, suffer greatly from wild horse use. It is possible to manage cattle grazing and limit their use to short periods if it is done right. This can allow ‘some’ recovery of riparian conditions around springs and along streams during the rest of the growing season. Wild horses hammer those areas yearlong. They go there for water, and if there is nothing to disturb them, they’ll stay and graze until the riparian vegetation is eaten to the dirt. What does that do for nesting songbirds and other species dependent on riparian vegetation for habitat? BLM is mandated by law to “manage wild-free roaming horses and burros in a manner that is designed to achieve and maintain a thriving natural ecological balance on the public lands.” Unfortunately, where wild horses are concerned, the phrase “thriving natural ecological balance” is highly questionable. Wild horses, wildlife, livestock and fish are like crops that are grown on our public lands. If a farmer grows nothing but wheat on his farm, he will get a certain yield of wheat, depending on the land’s capability. If he tries to grow both corn and wheat, he will not get as much wheat as he would if he grew wheat alone. The same is true of our western rangelands and forests. When you try to accomodate more than one land use, other uses will suffer. When you manage the public lands to produce and maintain wild horses and cattle, the ability of the land to produce wildlife and native vegetation will be reduced. Even using the land for recreation or timber harvest will reduce the ability of the land to produce native wildlife and vegetation. Our government tries to please everybody, and these horses are here to stay. But, their numbers must be managed and in most cases, reduced. The next time your tour a wild horse herd area, look at the riparian vegetation around the springs and along the streams. (Make sure you are looking at the core areas of horse use, not fringe areas like the Greenfire Preserve). What condition is it in? Is there a thriving, natural ecological balance? And how many piles of horse dung are evident? I can tell you this, I love my horses out back in the pasture, but I don’t love feral horses on public lands. If you’re going to maximize elk numbers on public lands, don’t expect to do it with thriving wolf populations. 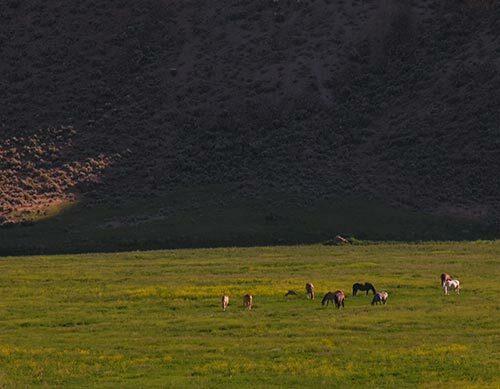 At the same time, don’t expect thriving riparian areas and abundant nongame and sage grouse populations if you want to grow wild horses on your public lands. As an avid bird and wildlife watcher in Utah, I have learned about the devastation wild horses can cause to eco-systems where are they are a non-native species. Erin commented that calling them non-native is “off-base”. My understanding is that horses arrived with Spanish explorers during the 1500s which make them a non-native species. How does a biologist define a non-native species? Thanks for your help. It’s just that you’d have to then be fair to analize the “negative” affects from other non-“native” species on the same area as horses. There are many species of feral animals that came across the sea with explorers hundreds of years ago and since. With the land bridge and sparse humans to document or tell tale, horses as well as other species not considered by some to be “native” could have been on this continent. I thought adoption programs were a way for BLM to regulate overpopulation of feral horses in areas, and to make money with them? I thought that horses originated in North America and then migrated over the landbridge to Asia. Meanwhile, they died out in North America and then were eventually reintroduced by the Spaniards. So in fact they are native. The link below is to a 2004 article by the curator of the Draper Museum of Natural History. It gives a pretty good overview of the wild horse situation in North America and is where I gleaned the horse information for my commentary below the link. As for how a biologist would define a non-native species, I’d assume they’d use the criteria of whether or not a species has continually occupied an area for a significant portion of time and whether or not it originated in that area or migrated there naturally (without relatively direct human interference). For example, elk orginated in Eurasia and migrated to North America and are considered a native species here. I believe the horse native/non-native debate is a fairly unique situation. Still, I feel if natural ecological conditions deemed their extinciton along with their contemporaries, they should remain extinct in the wild of North America today for eco-system integrity. The city of Scottsdale, AZ and its 220,000 residents surround the Salt River Pima Indian Reservation and its herd of 20 – 30 very wild horses. My understanding is they have been out there for over 100 years. The reservation holds about 60 sq. miles of wild habitat through which the horses are free to roam. Water is available in canals which cross the area. Although the area is true Sonoran desert, the herd seems to fair well even in the severe droughts of recent years. Since I live on the edge of the reservation, I often enjoy seeing them in their natural setting. A truly amazing animal. As a biologist I guess I could argue that a non-native species could be defined in a couple of ways – one, a species that was introduced as a result of european settlement of the American continents, or – two, one that did not evolve naturally into its present form along with the ecosystem where it is now found. In most cases, both situations apply to any introduced or non-native species. There is probably a book definition for it and I am sorry I have not taken time to look it up (and let me also apologize for getting so verbose here). We now have non-native species virtually everywhere on the American landscape that are the direct result of Euro-american settlement – millions of stray cats, starlings and pidgeons, the Kentucky bluegrass in our lawns (also found in riparian areas on public lands), tumbleweeds and game birds such as ringneck pheasants and chukar partridge. All of them are examples of non-native species. Some non-native species fit in well and cause no apparent or serious negative impacts to native plant and animal communities. Pheasants, partridges and K. bluegrass are examples of that. But the stray and feral cats that kill native songbirds and baby cottontails in my yard, the starlings that take over nesting cavities and bird houses from native bluebirds and swallows, and feral horses that graze riparian areas and remove the vegetative cover needed by native wildlife such as sage grouse and cutthroat trout. The former are examples of non-native species that can and do have serious impacts on native plants and animals (we Euro-Americans are also in the same non-native group). BLM tries to manage the Challis Wild Horse Herd for a base population of approx. 185 animals. To maintain that number, they have to round up about 90-100 animals every two years (at a much greater expense than is ever recovered from adoption fees). Despite that number (185-285 animals), there are still some serious impacts evident to me on native plant communities in the Challis Wild Horse Herd Area (some current and former BLM employees may argue differently, however.) If native plant communities are impacted, what about the native animal species dependent on them? Not to mention the trampling and direct disturbance and displacement of native flora and fauna as a result of wild horses just going about their daily business. Today’s wild horses have now been on the landscape for maybe 300 or 400 years. But, at what number? Probably not very many (except in the immediate home territory of some Native American tribes), and they were certainly not constricted by fences like they are now. They also did not share the landscape with millions of cattle. Does that make them native? I would agree with Tristan Howard’s comments above, they have not been here long enough. The wild horses of today, or even the prehistoric horse species that was present eons ago did play a role in shaping our native plant and animal communities. As pointed out by Tristan, the horses of today are not even the same species as the ones that originally evolved on the N. American continent so long ago. But, we are stuck with the Euro-American horses that are present on our public lands now. Stuck with them by law. And all we can do is insist on proper management of their numbers to meet the intent of a “thriving natural ecological balance” on the public lands, whatever that means. Does it mean that “existing numbers” of wild horses have to be maintained when they are having a direct impact on the habitats of native species such as the Greater sage grouse? And, do those numbers have to be maintained if populations of native species like sage grouse are in decline? I wish it were not so. Thanks Jerry -for the very thoughtful and thought-provoking posts. Arguing that the modern horses unleashed by the Conquistadores are “native” to the continent because their progenitors were here 10,000 years ago is as absurd as arguing that elephants are native because their progenitors were here 10,000 years ago. Here, posted with permission, is a piece from the current Audubon magazine that says it all. Good for Audubon for having the spine to take on the horse mafia. We know about them from magazines and coffee-table books: “wild horses”-a.k.a. “mustangs”-cultural icons, symbols of freedom and the American pioneering spirit. Usually they stand on their hind legs, pawing the gaudy sky, eyes flashing, nostrils flared and venting steam. Or they gallop across purple sage, long tails and manes streaming in the desert wind. Always they are in fine flesh. In the pictures. I love horses. I grew up with them, trained them, competed in horse shows, rode to hounds in Old Chatham, New York. All my early girlfriends who hung around our barn whether I was there or not could accurately draw horses, mostly “wild” ones. Mobilized by “Wild Horse Annie”-a Nevada ranch wife named Velma Johnston-they and other grade-schoolers across America wrote impassioned letters to senators and congressmen, demanding that “wild horses” be preserved other than in dog food cans. The upshot was the Wild Free-Roaming Horse and Burro Act of 1971, which placed all unrestrained, unclaimed equids (horses and burros) under government care and made it a felony to kill, capture, sell, or even annoy one. Under this law the departments of Agriculture and Interior must manage free-roaming equids in such fashion as “to achieve and maintain a thriving natural ecological balance on the public lands.” That mission is impossible for two reasons. First, the feds don’t begin to have the capacity for nonlethal feral-equid management. Second, horses or burros cannot exist anywhere in North America in “natural ecological balance.” They are aliens. The argument that equids are “native” to this continent because their progenitors were present during the Pleistocene -a mantra from the wild-horse lobby-makes as much sense as claiming that elephants are native because woolly mammoths were here during the same period. Roughly 10,000 years after the extinction of North American horses, Spanish explorers introduced a larger domesticated species. But the continent’s plant communities, having coevolved with ungulates that had cloven hooves and lacked upper teeth, were ill-equipped to handle solid hooves and meshing incisors. Result: ecological havoc. Another mantra from the wild-horse lobby is that the “mustangs” extant in Arizona, California, Colorado, Idaho, Montana, Nevada, New Mexico, Oregon, Utah, and Wyoming are closely related to animals unleashed by the conquistadores. They are not; they are mongrels-a genetic morass of breeds issuing mostly from recently escaped or discarded livestock. As you remove feral equids, those that remain are less stressed and breed faster, increasing the population by as much as 30 percent annually. Natural equid predators-saber-toothed tigers, cave bears, and dire wolves-are extinct, and any unnatural predator has to be pretty desperate to risk getting bludgeoned by the hooves of a feral equid. (“Probably as many mountain lions have been killed by horses as horses by lions,” says Campbell.) Although we can find $40 million annually to keep an alien on perpetual welfare, we invest only $74,472 a year trying to keep the average threatened or endangered species from going extinct. Such are the priorities of the American public. The BLM, which has a reputation for underestimating equid populations and has no reliable way of figuring them anyway, claims that just on its own land there are about 32,000 animals, mostly horses. An additional 26,000 are being maintained in holding facilities, awaiting adoption. At auctions held around the country the BLM adopts out about 6,000 feral equids a year. But it admits that that’s not enough to keep the feral population in check, and there’s a limit to how many feral equids the public wants. Generally, you pay a $125 “adoption fee,” and after you get a vet to sign a statement that you’ve provided humane care for one year, you get a certificate of title and can do anything you want with your horse or burro, including selling it to a slaughterhouse. The BLM is between a rock and the equine lobby. Two basic elements comprise this lobby-one somewhat practical, somewhat rational, and genuinely and rightly concerned about humane treatment of feral equids. In its more thoughtful moments the Humane Society of the United States might fit this description. While it doesn’t worry about native ecosystems, it at least understands that population expansion leads to major suffering, and it is assisting the BLM in experiments with chemical contraception. “Where population reductions are well justified, nonlethal strategies like contraception should take the place of costly roundups,” wrote HSUS president Wayne Pacelle in a letter to The New York Times. But until contraception is practical over large areas of the West, if it ever is, the HSUS favors roundups and adoptions over culling by rifle. In the late 1990s National Park Service biologist Erik Beever, then a doctoral candidate at the University of Nevada at Reno, ran afoul of the horse mafia by discovering facts not to its liking. In the most comprehensive investigation ever undertaken of what feral horses do to wildlife habitat, Beever examined soils, rodents, reptiles, ants, and plants across nine mountain ranges at 19 study sites, documenting dramatic horse damage. For this the horse mafia viciously attacked him in the press, accusing him of whoring for the cattle industry, which doesn’t like grazing competition from feral livestock. “It got pretty nasty,” Beever recalls. His work provided the BLM with the means, if not the motivation, for determining how many horses should be removed from an area for their own good. Now and then, however, environmentalists outmaneuver the horse mafia. One of the first Important Bird Areas to be recognized in Nevada and possibly the best cottonwood gallery riparian forest left in the West is the Carson River delta-vital to all manner of birds, including western yellow-billed cuckoos and two subspecies of willow flycatcher. “The BLM had a management goal of 18 horses but let the population grow to 200 to 300,” reports Don McIvor, Audubon’s Nevada director of bird conservation. “They were hanging out in the riparian area, removing the understory, trampling willows, causing major habitat damage.” The BLM wasn’t doing anything about it, so McIvor and his colleagues complained to the Nevada Depart- ment of Wildlife, which prevailed on the BLM to remove all but 15 of the horses. The horse mafia never found out that Audubon was the driving force behind the roundup, so its full fury was directed at the state and feds. Native animals are also capable of intense suffering. All manner of wildlife depend on desert trees such as paloverde, mesquite, and ocotillo. Small mammals are nourished by their seeds; birds nest in their branches; reptiles find sanctuary in their shade; desert bighorn sheep browse on their tender tips. Horses and burros girdle them with their meshing incisors, then stomp them into the dirt with their solid hooves. Supplee used to conduct Christmas bird counts in what she calls “lush and canopied dry riparian washes with huge mesquite and paloverde trees.” Feral horses moved in and trashed the habitat. “They broke off branches, stripped the bark, and killed the trees,” she says. So what’s to be done? Congress hasn’t a clue, but in December 2004 it did make its first feeble attempt to address the problem by passing a law that allows the BLM to sell a feral equid that is more than 10 years old or-for whatever reason, physical or behavioral-has been rejected for adoption three times. The Cascadia Wildlands Project warned that the legislation was really a scheme to remove horses “from their native habitat,” the better to slaughter “thousands.” And Wild Horse Preservation identified the program as a plot by the cattle industry to “funnel wild horses to slaughter.” The following spring, when 41 feral horses found their way to a slaughterhouse, the agency shut down the new program until it had hatched a tough sales agreement that requires buyers to swear in writing they won’t sell their animals for meat-this despite the fact that about 90,000 domestic horses were sold for meat last year. No feral equid has been slaughtered since, but the horse mafia is still in full cry. It is difficult to understand why Americans believe that starvation is more humane than culling. In Australia, where there are thought to be as many as 265,000 feral horses and 5 million feral burros, the government shoots them. According to its Model Code of Practice for the Humane Control of Feral Horses, “Shooting is considered more humane than capture and removal as the animals are not subject to the stresses of mustering [roundup], yarding, and long-distance transportation.” Moreover, most other nations don’t share our taboo against eating horse meat. It’s considered a delicacy in Europe, and in Australia the commercial slaughter of feral horses, burros, and other livestock is a $100 million-a-year industry. Australia is working on chemical contraception, too, but an effective agent practical for field application may be decades away. In the United States, at least, there is still time for an alternative to shooting and starvation-leaving and managing a few herds of feral horses and burros of alleged “historical significance” on adequate range, perhaps on retired cattle-grazing leases, but rounding up and caring for the others. As expensive as this would be, the main investment would end when the captured animals died of old age. As it stands now, though, the powerful horse mafia won’t hear of such a thing. And fish and wildlife advocates shudder at the Australia-style disaster that apparently lies ahead. Thanks for the comments. Certainly enlightening. I was particularly struck about the info concerning how feral horses have degraded wetlands. In many parts of the West, amphibians are in alarming decline, and our Western states boast several very endangered frogs with extremely restricted ranges. There is a whole host of circumstances, often acting together, that are facilitating amphibian declines… development, habitat destruction, pollution, chytrid fungus, introduced predator fish…. I wonder if wetland degredation by feral equids have ever been investigated in any local amphibian declines? The Audubon article posted by huck says it all. Thanks everybody, for taking the time to learn more about this issue!